The trailer for Ghost Rider: Spirit of Vengeance, the sequel to the 2007 cinematic masterpiece, Ghost Rider, has it all: creepy precocious child actors, talking skeleton demons all ablaze, the devil taking on human form, a guy with blond hair. 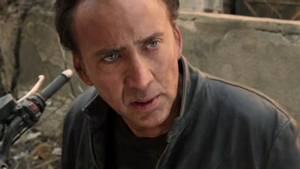 Topped off with the ultimate coup de grâce that is Nic (insert facial tic) Cage. Already we see him on a motorcycle, we see him cracking jokes, we see him doubled over, his body racked with sobs. Ah yes, right where we left him. Personally, I could watch Nicolas Cage saying things like, "We better make sure he doesn't turn out to be the Anti-Christ" in his gravel-speak on loop by itself. But because life doesn't always give us what we want and because it takes all kinds to make a movie, let's just agree that this looks absolutely terrible and belongs locked in a false bottom dumpster. If it weren't for the excellent Ciarán Hinds' (the hottie from The Debt) unexplainable participation, I would suggest that we immediately crack open Tutankhamun's tomb and throw this reel in where it should remain sealed away from human eyes for all eternity. This thing looks terrible and not even just by summer blockbuster standards (also, this is not even a viable excuse considering the movie's release date of February 17). Hey you guys up in Hollyweird, it's like you're not even trying anymore. And because you guys sat through that hunk-o-junk, here's a bonus trailer for the whodunnit classic, Clash of the Titans 2: The Godfather's Tantrum.